As a guideline, on a First Class category barge you may expect to find comfortable cabins ranging from 91 – 115 sq. feet, and relatively small, though very well designed and equipped bathrooms. Some First Class barges do not have a jacuzzi on deck and will have cosy salon and dining areas with attractive decoration. Our First Class barges are very charming and offer a delightful barge cruise holiday. Charming Anjodi is a charming Dutch-designed barge full of character, made famous by “Rick Stein’s French Odyssey”, in which she was the star. Anjodi cruises the stunning Canal du Midi and includes the fairytale city of Carcassonne. 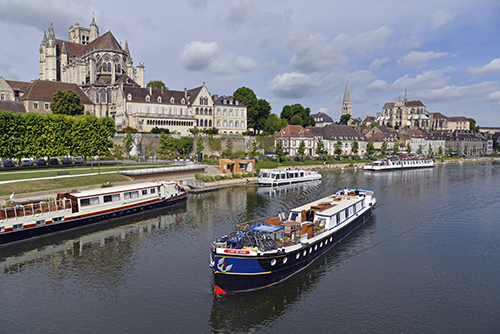 The beautiful Nivernais Canal offers a French canal cruise full of “off-the-beaten-track” experiences and a dreamy, relaxed environment that is a far cry from some of the busier canals. This charming region is full of renowned wine villages such as Chablis. The Athos offers the best of Canal du Midi cruises and is the largest barge on the canal, offering 5 cabins for a maximum of 10 guests. Enjoy fascinating excursions, fresh seafood and southern wines for a true Mediterranean cruise experience. Luciole is one of the oldest and most beautifully-run barges on the canal, with an exceptional and excellent value for money, especially for single travellers. We love the Nivernais Canal – a truly stunning, quiet corner of France!